After 36 years of operational activity the 'Netz' (F-16A/B) landed in Ouvda AFB from their final flight last Dec.26, 2016. The first four "Netz" aircraft landed in Ramat David AFB on July 2, 1980. A few months after their arrival, it already had a significant achievement to its name: the aircraft's first shut down in the world. The historic shut down took place in April, 1981, when Brig. Gen. (Res.) Rafi Berkovitch shot down a Syrian Mil-Mi 8 helicopter. Since that shut down and to this day, the "Netz" has conducted countless missions and partook in many operations; the 2006 Second Lebanon War, 1996 Operation "Grapes of Wrath", 2008 Operation "Cast Lead", 2002 Operation "Pillar of Defense" and 2014 Operation "Protective Edge" being just part of the operations the "Netz" took part in. In fact, during its years of activity, the aircraft has conducted 474,000 sorties and 335,000 flight hours. "In the history books, the 'Netz' will be written as the aircraft that changed the face of the Middle East", stated Brig.-Gen. Amir Eshel, IAF Commander, in the ceremony. "A strategic achievement that will stay for generations"
The most known sortie by the "Netz" is the destruction of the Iraqi nuclear reactor during 1981 Operation "Opera", that symbolized a significant milestone in the aircraft's activity and for the IAF. In an interview with the IAF Magazine, Maj.-Gen. (Res.) Amos Yadlin, then Deputy Commander of the F-16 Squadron and one of the eight combat pilots that took part in the operation, shared: "The nuclear reactor was protected by SAM batteries that were brought there after the Iranians tried attacking it in January, 1981. The IAF had never flown such a far distance and the last 'leg' was in a flat zone filled with high voltage poles in which the Iraqi Aerial Defense forces could easily discover us". Despite the difficulty, it is clear that the attack on the nuclear reactor was one of the most impressive achievements in IAF history. "I believe that this operation is proof of Israel's need of a strong and quality, creative and daring air force", added Brig.-Gen. (Res.) Yadlin. "This is an example of how one tactical sortie of eight attack aircraft and six interception aircraft, could achieve a strategic change that will remain valid for generations to come". Alongside the successful operational work the "Netz" is credited for, one cannot forget its activity in the training fields: IAF Servicemen consider it simple and comfortable to fly. The "Netz" aircraft have a resume that also include training combat pilots and WSO's in the Combat Training Course and Advanced Combat Training Course, which the aircrews complete at the end of their pilots course. 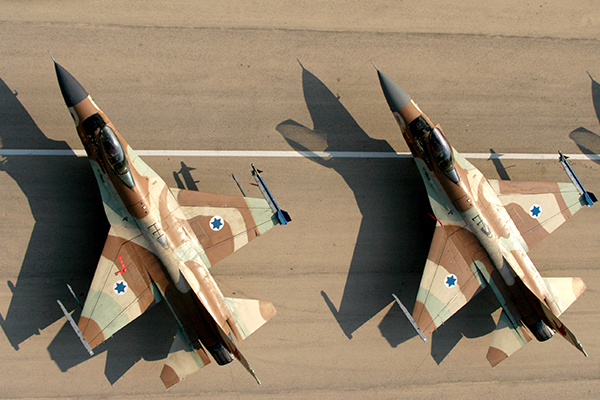 "Flying Tiger" Squadron near Hatzerim AFB will take the "Netz's" place as a combat training aircraft. "Since 2000, 'Barak' (F-16C/D) and 'Raam' (F-15I) and 'Sufa' (F-16I) take part in most of the operational activity in the IAF", explains Lt. Col. Udi. "The 'Netz' took a step back in its operational activity but found a way to continue giving - it trained the next generation of pilots". The "Flying Falcon" may be completing its service, however it seems it will have a lasting influence for many more years as it seems those who learned from and flew the aircraft will be continuing their service in the IAF. Maj. Itzik: "We are a few people, with few means, but with so many accomplishments and so much work".